Jennifer Lynn Barnes has been a favorite author of mine since I first read The Naturals. When I heard that she had a new book coming out and part of a different series, I couldn't have contained my excitement if I had tried. Thankfully, the author has delivered once again, and there is absolutely no part of this book that I don't adore. Fans of Ally Carter and Barnes's other series will probably love this book as much as I do, so if you're familiar with these names, go get this book now what are you waiting for?? I've said this before through Twitter, but I have to say it again: THIS REMINDS ME SO MUCH OF SCANDAL. If anyone watches the show or is interested in the idea of "fixing" politicians' problems/images, then this is for you. 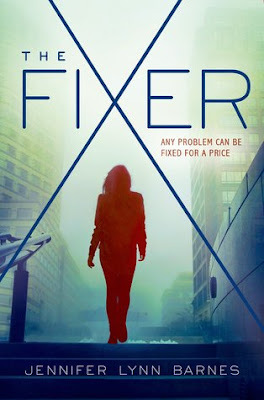 What I like about the novel version is that the story focuses more on the fixer's little sister than the fixer herself. Don't get me wrong, I would love the chance to get the fixer's story firsthand - there is a lot of potential romance there - but the younger sister's story was good enough for me. There was action, intrigue, amazing friends, and a one-of-a-kind support system behind the main character, Tess. This book was indescribably amazing. Tess, she was stupendous. Can she be my new role model? She isn't afraid to help others even if she becomes the center of unwanted attention, and oh my gosh she was so badass. She's loyal to her friends and her family, and will stubbornly give up anything and everything for them. She's brave and smart and her thoughts are super entertaining, so basically my dream character. Tess stands up for what's right, and she's a pretty great fixer in her own right. And there's this one scene where readers get to see how vulnerable she really is and how the people she surrounds herself with helps her out of her funk, and it's just really beautiful. Barnes, you are an amazing writer. The next best aspect was probably the side characters because they were basically the best thing ever. I want to read this book over and over again just so I can re-introduce myself to them...over and over again. There's Henry and Vivvie and Asher and his sister and they're all super amazing! I fell in love with each one as soon as I met them, and I'm still in love with them. Why? Well, Asher, he has all the charm. Like, probably all the charm that exists in this world. Asher grinned like I'd just professed my love for him. Then there's Henry, and, well, you just know he's exactly my type. He's the strong and silent type, and he has this ridiculously amazing love-hate relationship with Tess. I snapped up every little discussion and moment of eye contact between the two, and I regret nothing. Henry Marquette isn't really one for communication. Or sharing. Or the outward display of human emotion of any kind. And Vivvie is just ridiculously adorable and perfect and I would really love to have a best friend like her. If you think you are like her, then please send me a resume with your deets so we can be besties. I'm not even joking, Vivvie and Tess are #BFFgoals. "I'm fine," I told Vivvie. Her brow furrowed. Clearly, she was less than convinced. "Would you feel better," she said seriously, "if I recapped my favorite horror movie and/or romance novel for you?" Ugh, those characters are just perfect. Are there real people in the world like this, because I need to meet them. Now that I've explained the awesomeness of the characters, the only reasonable place to take this discussion next is the romance. Or I suppose I should say the lack of romance. This probably doesn't make sense, but the romance was there while simultaneously not being there. I love both of the potential love interests, Asher and Henry, and while there are several cute moments throughout the plot, none of them are really presented as love interests yet. Personally, I think this is great because for once, the love story doesn't trump the actual mystery. As it is, I'm freakishly excited to see how Tess's relationship develops with either or both love interests. And did I mention how highlight-worthy this book is, because it is so highlight-worthy. I was highlighting what was pretty much every other line while reading the novel, and it's so much fun looking through those quotes (I'm doing that right now, actually). It was the combination of the amazing characters and freaking awesome lead that had me screaming for joy, for this book. It's been a while since I've been so satisfied after reading a book. All I can say is that if you're reading a physical copy of this book, have your sticky tabs ready. Also, you should totally know there's a plot twist coming your way if you pick up this book. I feel comfortable saying this since there's a little to no chance you'll guess what that twist is, and now you'll be scratching your head wondering what the twist is the entire time you're reading the book (and no, don't you dare skip to the end to see what I'm talking about). This twist kind of reminds me of that in All Fall Down by Ally Carter, but mostly because there was no way I could have predicted that one either. While the twist itself was pretty rad, it's the aftermath of it that I found to be the best part. I loved seeing all the awesome people in the novel supporting Tess, and every awkward moment/flashback coming together and starting to make sense - it's always nice when a book has a bit of unpredictability to it. What this all comes down to is, if you are a human being who reads YA, then I recommend this book to you. Book Synopsis: This thriller YA is Scandal meets Veronica Mars.